He learned the principles of the stoic philosophy, which so well suited his character, under Antipater of Tyre, and applied himself diligently to the study of it. Eloquence he likewise studied, as a necessary means to defend the cause of justice, and he made a very considerable proficiency in that science. To increase his bodily strength, he inured himself to suffer the extremes of heat and cold; and used to make journeys on foot and bare-headed in all seasons. When he was sick, patience and abstinence were his only remedies: he shut himself up, and would see nobody till he was well. Though remarkably sober in the beginning of his life, making it a rule to drink but once after supper, and then retire, he insensibly contracted a habit of drinking more freely, and of sitting at table till morning. He affected singularity, and, in things indifferent, to act directly contrary to the taste and fashions of the age. Magnanimity and constancy are generally ascribed to him; and Seneca would fain make that haughtiness and contempt for others, which in Cato accompanied those virtues, a matter of praise. Cato, says Seneca, having received a blow in the face, neither took revenge nor was angry; he did not even pardon the affront, but denied that he had received it. His virtue raised him so high, that injury could not reach him. He served as a volunteer under Gallius in the war of Spartacus; and when military rewards were offered him by the commander, he refused them, because he thought he had no right to them. Some years after, he went a legionary tribune into Macedonia under the praetor Rubrius; in which station he appeared, in his dress, and during a march, more like a private | soldier than an officer but the dignity of his manners, the elevation of his sentiments, and the superiority of his views, set him far above those who bore the titles of generals and proconsuls. It is said, that Cato’s design in all his behaviour was to engage the soldiers to the love of virtue; whose affections he engaged thereby to himself, without his having any such intention. One thing by which Cato extremely pleased the people, was his making the assassins to whom Sylla had given considerable rewards out of the treasury for murdering the proscribed, disgorge their gains. Plutarch tells us, that Cato was so exact in discharging the duties of a senator, as to be, always the first who came to the house, and the last who left it; and that he never quitted Rome during those days when the senate was to sit. Nor did he fail to be present at every assembly of the people, that he might awe those who, by an ill-judged facility, bestowed the public money in largesses, and frequently through mere favour granted remission of debts due to the state. At first his austerity and stiffness displeased his colleagues: but afterwards they were glad to have his name to oppose to all the unjust solicitations, against which they would have found it difficult to defend themselves. 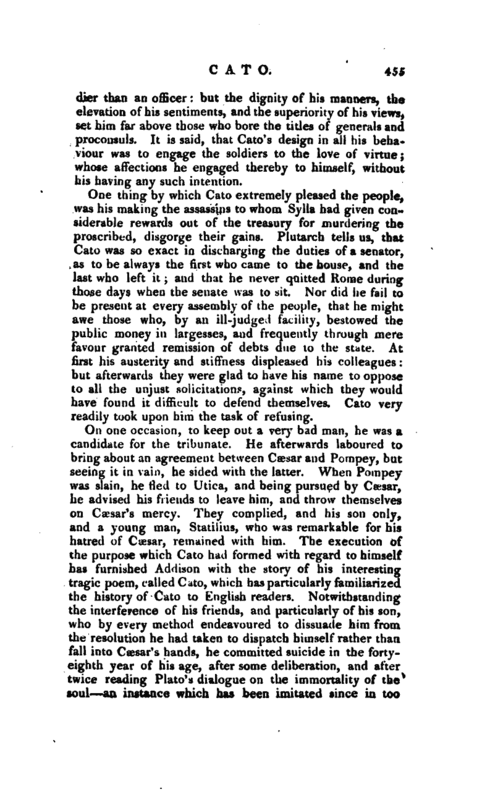 Cato very readily took upon him the task of refusing. On one occasion, to keep out a very bad man, he was a candidate for the tribunate. He afterwards laboured to bring about an agreement between Cæsar and Pompey, but seeing it in vain, he sided with the latter. When Pompey was slain, he fled to Utica, and being pursued by Cæsar, he advised his friends to leave him, and throw themselves on Cæsar’s mercy. They complied, and his son only, and a young man, Statilius, who was remarkable for his hatred of Cæsar, remained with him. 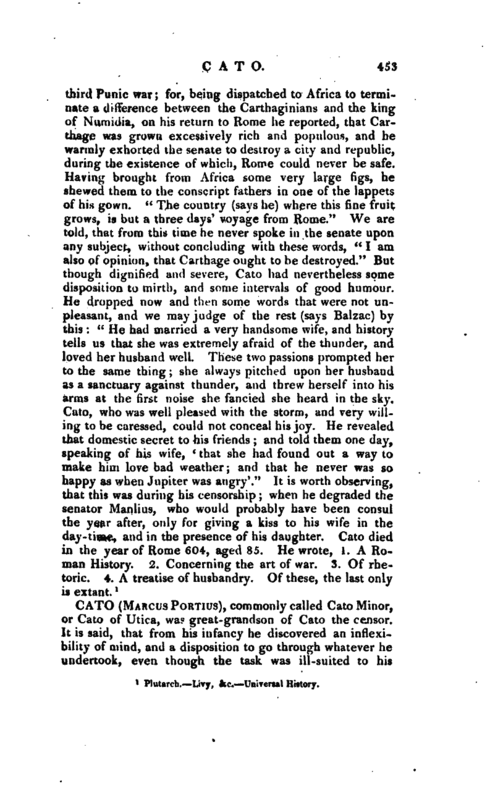 The execution of the purpose which Cato had formed with regard to himself has furnished Addison with the story of his interesting tragic poem, called Cato, which has particularly familiarized the history of Cato to English readers. 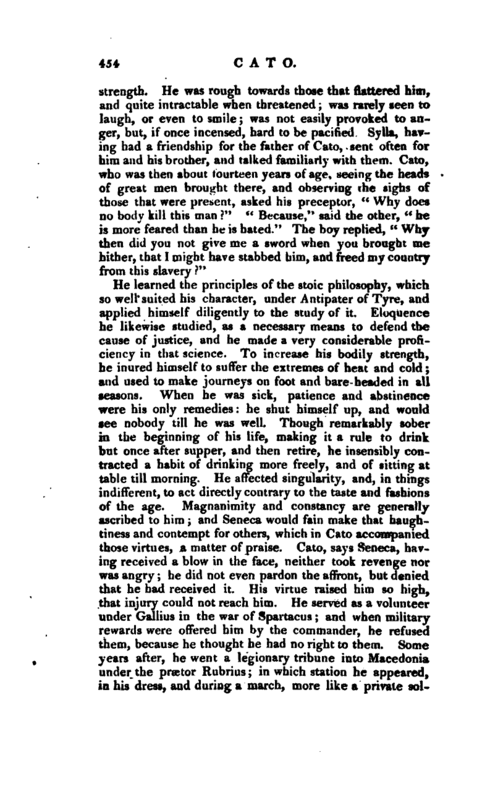 Notwithstanding the interference of his friends, and particularly of his son, who by every method endeavoured to dissuade him from the resolution he had taken to dispatch himself rather than fall into Cæsar’s hands, he committed suicide in the fortyeighth year of his age, after some deliberation, and after twice reading Plato’s dialogue on the immortality of the soul an instance which has been imitated since in too | many cases of political disappointment, and in the absence of all moral and religious principle. 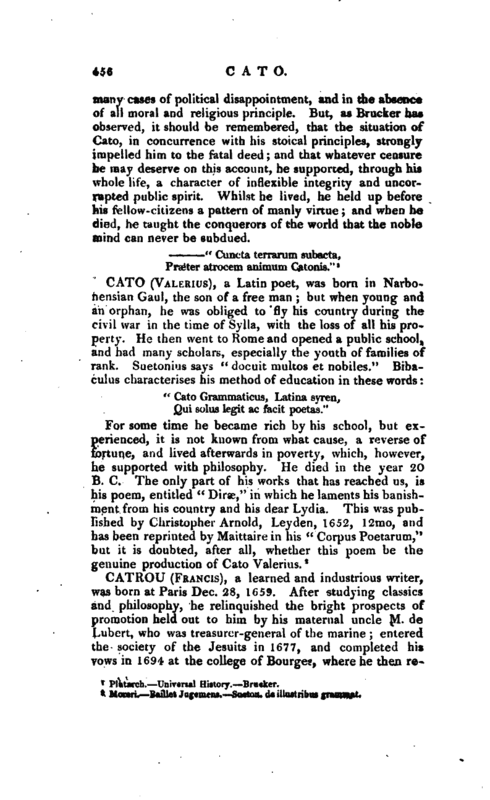 But, as Brucker has observed, it should be remembered, that the situation of Cato, in concurrence with his stoical principles, strongly impelled him to the fatal deed; and that whatever censure he may deserve on this account, he supported, through his whole life, a character of inflexible integrity and uncorrupted public spirit. Whilst he lived, he held up before his fellow-citizens a pattern of manly virtue; and when he died, he taught the conquerors of the world that the noble mind can never be subdued.